For children, there are many benefits to dedicating time outside of school to extracurricular activities like music lessons or sports that will challenge their brains to think in different ways and provide an outlet for creativity and physical energy. While signing your child up for soccer or basketball definitely has a number of healthy rewards, a musical instrument education provide many of the same benefits - plus a few additional ones. Children can build many of the same communication and teamwork skills whether they are in music lessons or sports. Learning a sport is not so different than learning a musical instrument. Both require patience, dedication and teamwork. These are wonderful skills for any child to build whether they are in grade school or high school. When it comes to practice and performance, students must pay attention to their peers and learn how to communicate whether they are in a practice room or a gym. However, people often don’t realize that music lessons can also be very physically demanding and provide some of the same cardiovascular benefits of athletics - just ask a percussionist, saxophonist or cellist here at Stage Music Center how they feel after a rigorous practice! 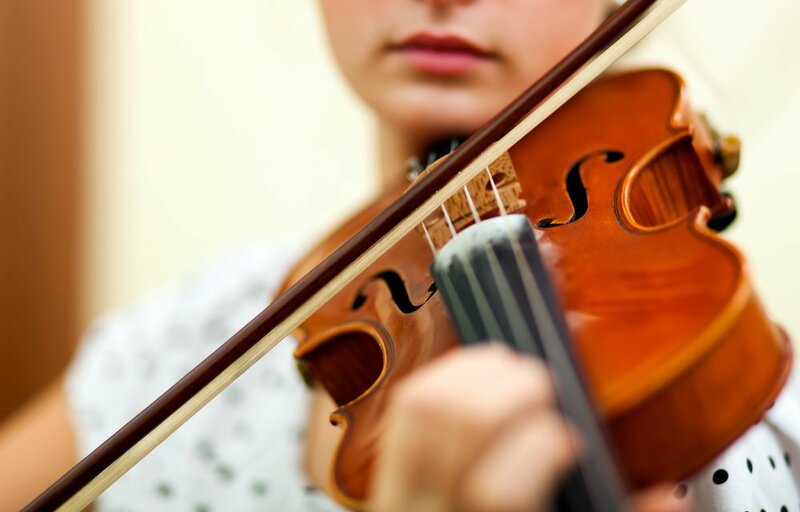 In addition to the physical exertion, young musicians will also learn balance, breathing techniques and coordination as they continue their lessons over the years. While students can develop focus and confidence with with music lessons or sports, the one-on-one training with a music teacher can help students learn in a less intimidating setting. Like in sports, there are also mental and emotional benefits to a music education. With both activities, students are developing better concentration and focus, as well as self-confidence as their skills improve. With music lessons, students often have the benefit of starting their training one-on-one with a teacher, like with the private music lessons we offer at Stage Music Center. In this setting, the teacher will provide a lot of immediate feedback and personal attention as children begin the self-conscious process of learning something new. For many students, this is a more positive way to learn as opposed to having an athletics coach holler instructions and corrections across a crowded field of their peers. The connection between instrumental education and the development of language and reasoning skills (including math) is well established. (You can read about a recent study done in the Netherlands exploring the effect of music education on cognitive abilities) As a result, music students are often strong test takers and have the ability to perform well under pressure. Both student athletes and student musicians learn early on that they need to dedicate the time to improve their skills. This is one of the key reasons why students should also stick with their music lessons over the summer. This dedication over a period of months and years helps young people understand the value of commitment and sticking with something, which is particularly important as technology continues to shrink our attention spans. Psychologists have noted how important it is for young people to have a dedicated activity that gives them a sense of progress and accomplishment. For music students, like budding artists or writers, they learn to master the classics so that they can one day start to develop their own unique and creative style. In essence, music lessons help students discover themselves and their own potential – for the proud staff here at Stage Music Center and our amazing students, this a total win in any playbook!